Sons of Steve Garvey: Suspensions! Get Yer Suspensions! Suspension: Kennedy 10 games, Hinske 5, Howell 2, Schumaker 2, McGwire 2, Belisario 1, Mattingly 1, Gibson 1. Fined but not suspended: Puig, Greinke, Montero, Parra. I think that's fair. I would have been mad if they suspended the Puigman. What did Eric Hinske do that we didn't see? Howell only got two games for trying to murder Turner Ward. Maybe Greinke will pick up Puig's tab for having his back? Gibson should be suspended 10 games along with Kennedy, since he was the mob boss who ordered the hit. Hinske was fined for always jumping on World Series-bound teams despite not having anything to do with those teams' success. 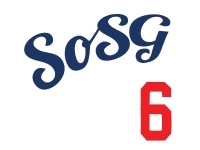 Dodgers giving SoSG a shoutout on twitter! I'm guessing Hinske got five games for punching a cash cow. 102 notes on Tumblr, too. Everyone on Twitter except Magic: "Suspensions!" Magic: "How about the Heat, huh? I saw that Nomo. He must be proud of our team. Who cares, we made the Dodgers twitter page! Yeah, we bad, uhuh. GT goes up at 1.